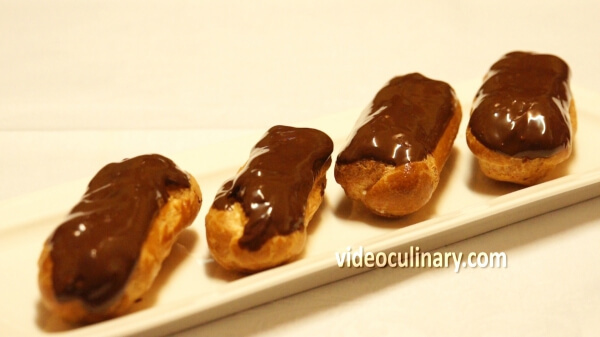 Eclairs are made of Pâte à Choux dough filled with diplomat cream (pastry cream lightened with whipped cream). 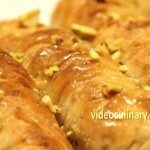 The dough is piped into a long oval shape and baked until crisp and hollow. 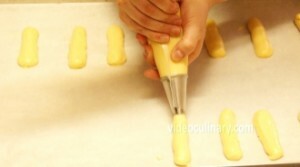 Pâte à Choux dough is also used for profiteroles, lady finger cake, croquembouche and other cakes pastries. 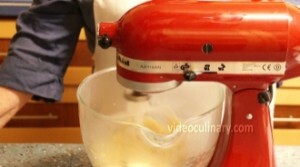 To make the pastry cream, combine 30 grams (1 oz) of starch with 40 grams (1.4 oz) of sugar. 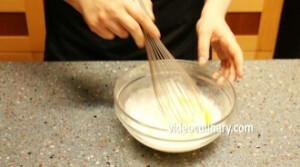 Stirring with a whisk, add 100 ml (3.4 oz) of the milk, and 2 eggs. Stir until the mixture is smooth. 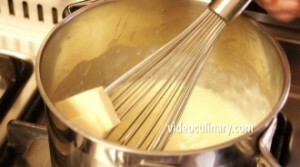 Combine 220 ml (7.4 fl oz) of milk, 40 (1.4 oz) grams of sugar and a pinch of salt in a saucepan and bring to boil. 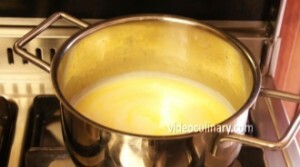 Temper the egg mixture by gradually adding the hot milk and stirring. 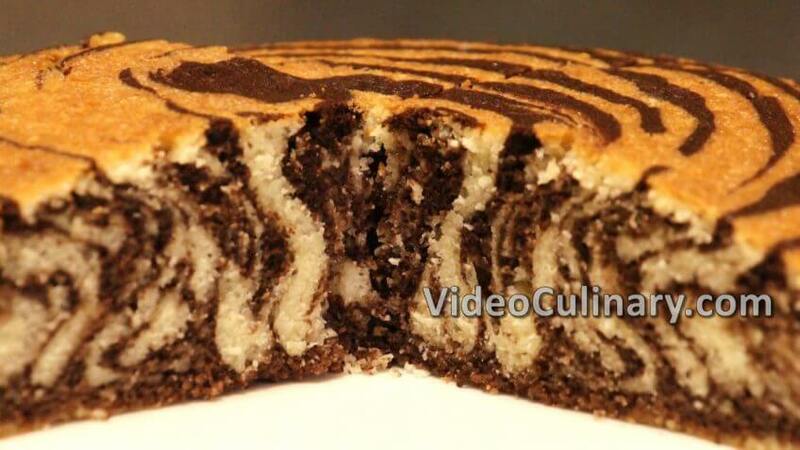 It is an optional to add gelatin to your pastry cream to make it thicker. 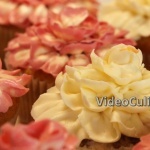 Bloom 1.5 teaspoons (7 g) of gelatin in 60 ml (2 fl oz) of water. 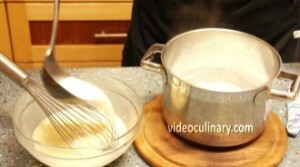 Meanwhile, pass through a chinois to make sure it is smooth. 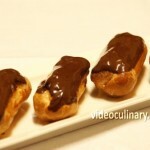 To make the pâte à choux, bring 150 ml (5 fl oz) of milk, 150 ml (5 fl oz) of water and 150 grams (5.3 oz) of butter to boil. Add 0.5 a teaspoon of salt. 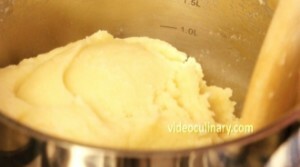 Once the butter has melted, add 200 grams (7 oz) of flour at once, and stir until the mixture forms a mass and pulls away from the sides of the pan. 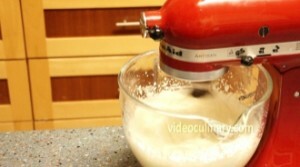 Transfer the mixture to the mixer and beat on low speed for about three minutes. 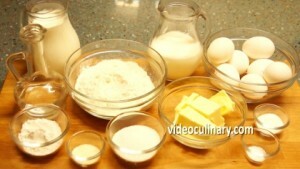 Add 6-7 eggs, one egg at a time, until the dough slowly slides down the paddle. Scrape down the sides of the bowl a few times in the process of adding the eggs. Fit a pastry bag with a plain tip of 15 mm in diameter (# 6). 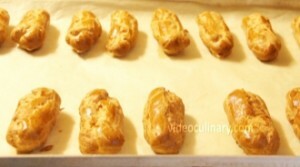 Pipe the Pâte à choux into 10 cm long cylinders (4 inch) on sheet pans lined with parchment paper. 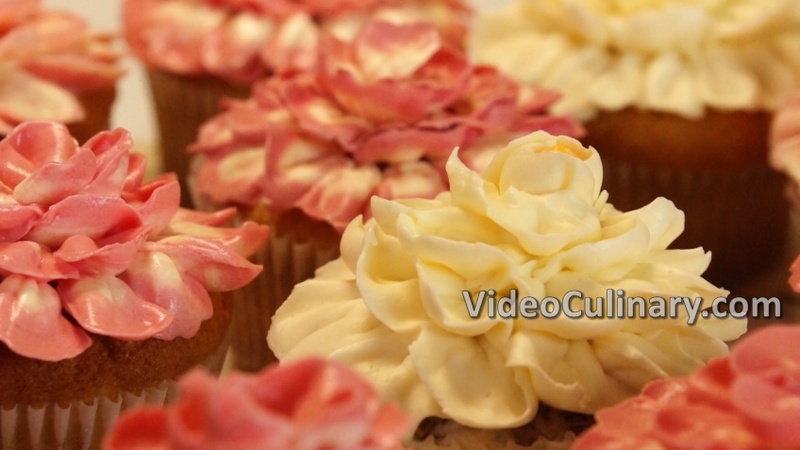 Lightly brush with egg wash.
Bake at 180°C (350°F) for 40 minutes. Cool to room temperature. 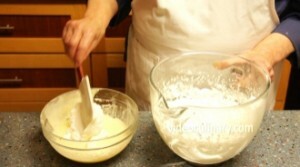 To make the diplomat cream, whip 500 ml (17 fl oz) of heavy cream with 10 grams of vanilla sugar. 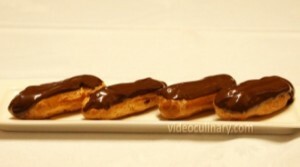 Pierce the éclairs and fill with the diplomat cream. 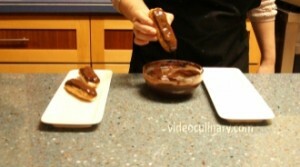 Dip the éclairs into chocolate or dust with powdered sugar. 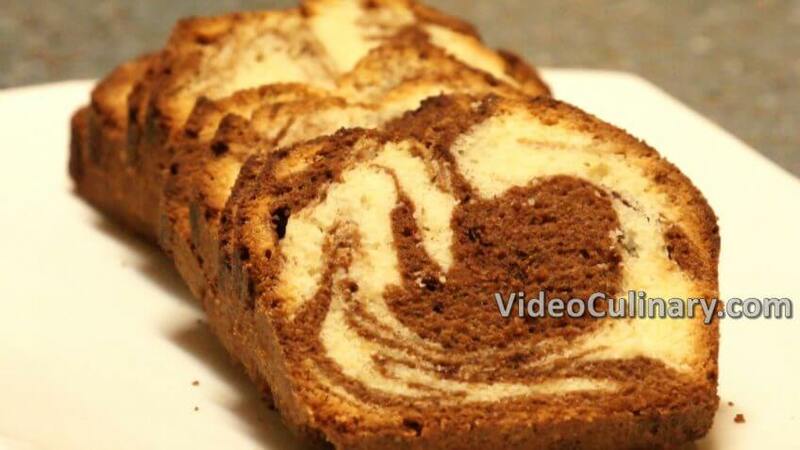 Good luck with your baking! 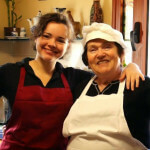 Please visit our website for more great recipes.